Click here to buy now or for more information about the deal. Expiration varies. Refundable only within 24 hours of purchase. Limit 8/person. Valid only for option purchased. Redeem on day of show for a ticket at the venue box office. Merchant is issuer of tickets – discount reflects current ticket prices, which may change. Disability seating cannot be guaranteed; contact box office prior to purchase for availability. Ticket value includes all fees. Merchant is solely responsible to purchasers for the care and quality of the advertised goods and services. 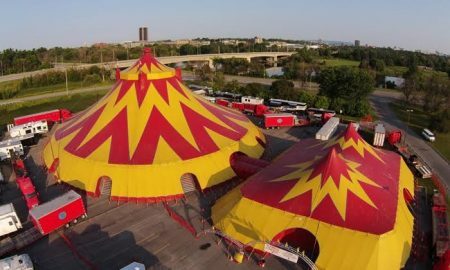 For the better part of a century, the Royal Canadian Circus has been delighting four generations of audiences with classic big-top acts. The current lineup, headlined by Ringmaster Extraordinaire, Joseph Dominic Bauer from Switzerland, continues the entertaining tradition: the Flying Cortes family soar through the tent, the Rola Bola Aristov from Russia executes various hand balancing athletic skills while suspended in the air, the Aristov Juggling Duo of Igor and Tatiana will dazzle and astound, The Chinese Acrobats Troupe will amaze on the low wire and balancing chairs, and aerialists and acrobats push the bounds of the human body. Graceful dancers and aerialists round out the cast. The Royal Canadian Family Circus is exotic animal free.